Amazing Keepsake for your team, sons or daughters at the Start or End of each Season by creating a memory for a lifetime for your Soccer / footballers! 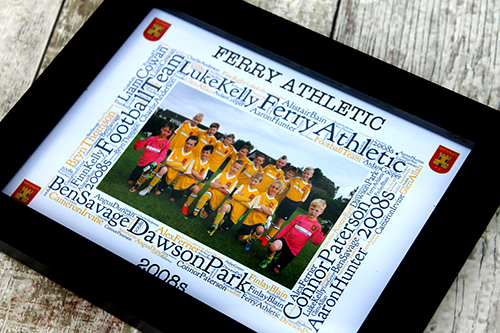 What they get is a personalised Team Frame – Ideal Gifts For The Football Lover. Add your own unique words, players names, the team logo, key competition dates and anything else you want! Our Football/ Soccer team frame measures 5inches by 7inches approx is hand designed, handmade professionally in the UK! It can hang from any wall, door or any other possible place you could hang a plaque from, with the natural twine which is included. 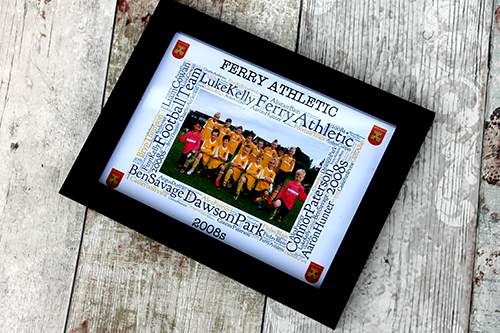 Personalised Football team frames make awesome gifts for the Football | Soccer lover, or for a friend or relative. They can hang anywhere in the home for a lovely decoration. Lovely gifts for the football lover or any Soccer | Football player who want’s to remember those good times with the Football team.